The ground support tower HD/FD34 makes for an excellent vertical truss that allows the safe, quick lifting of regularly loaded horizontal truss con- structions (riggs) and small to medium-sized platform roofs to their service height. 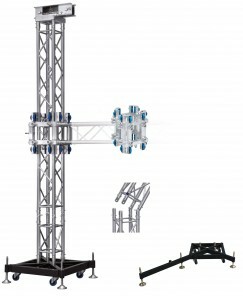 The straight elements of the tower consist of HD/FD34 Standard Truss, allowing a variety of combinations. This system is compatible with the type HD / FD34 Basement (Touring & ProBase – in aluminium – and a steel base with long and short outriggers), Hinge Section, Sleeveblock and Top Section. In terms of statics, ground support towers, indoor applications, are exposed to negligible flexural strain but primarily to pressure strain. In outdoor use, on the other hand, the tower is exposed to very high flexural strain due to the coverings or roof. FD34 Top Sections are available for manual or electrical chain hoist. A strong, safe and cost effective solu- tion to erect the HD/FD34 GS Tower. FD34 Touring base is identical to the professional base but with integrated short outriggers (4 per Touring Base). FD34 Steel base on wheels available with short outriggers or long outriggers in combination with stabilizer bars. The outriggers are available in short out- riggers and long outriggers in combina- tion with stabilizer bars and it depends on the purpose when which to use. At Outdoor Ground Supports, Roofs, Bridges or High Indoor Ground Supports the usage of long outriggers are to be advised. Next to the standard parts Eurotruss supply additional accessories, which can be demanded for different usage. For stability Eurotruss carries three diffe- rent outriggers. To obtain more stability in the rig, bold on cornerbraces are avai- lable.